With the MS International 10-1/2 in. x 15-1/2 in. Dove Gray Ceramic Mosaic Wall Tile, it's easy to add a splash of contemporary styling to your decor. This attractive tile features arabesque patterned pieces of ceramic arranged on a 10-1/2 in. x 15-1/2 in. mesh sheet that makes installation a much easier process. Trendy gray shades featuring a crackled look, this glossy ceramic creates a distinct pattern for various install projects in bathrooms, kitchens and other residential or commercial spaces. 11.3 square feet, 10 pieces per case. Case weight is 40 lb. 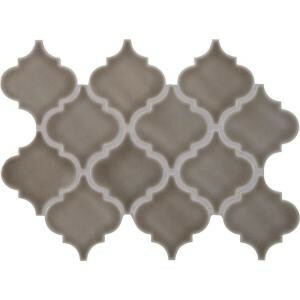 Buy online MS International Dove Gray Arabesque 10-1/2 in. x 15-1/2 in. x 8 mm Glazed Ceramic Mesh-Mounted Mosaic Wall Tile (11.3 sq. ft. / case) PT-DG-ARABESQ, leave review and share Your friends.